It’s that time of year again. We only have 2 doubles and 1 single available on our July Engadine Trek. Grab a spot while you can. Retreat in time to another era and a place far away: the enchanted En River Valley. Time forgotten 17th century villages with their fascinating architecture cling to the hillsides and numerous ruins and a castle mark the valley’s importance through the medieval period and Hapsburg Empire. Above the valley the peaks of the Silvretta, Lischana and Bernina ranges soar. This trek follows the length of the En River through Switzerland, from near the Austrian border to that of Italy…read more. 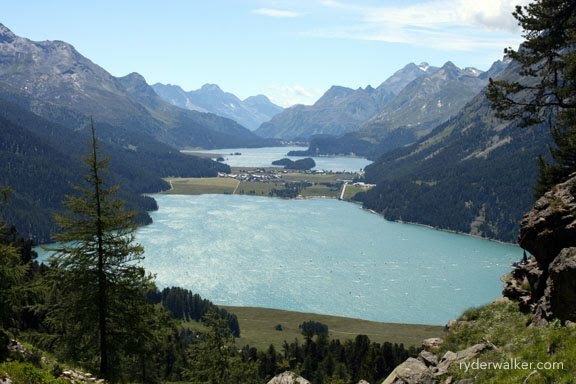 Image: Hiking into Sils Maria. The lake in the foreground is called the Silvaplanersee. The village of Sils Maria, our home for the night, rests on the isthmus between the two lakes.